The U.S. Coast Guard resumed its search early Saturday across Bahamian waters for a disabled cargo ship with 33 crewmembers, including 28 Americans, that lost contact during Hurricane Joaquin, which was moving away from the sprawling archipelago. The 735-foot (224-meter) ship named El Faro had taken on water and was earlier reported to be listing at 15 degrees near Crooked Island, one of the islands most battered by the hurricane. The Coast Guard said it hadn't been able to re-establish communication with the vessel, which was traveling from Jacksonville, Florida, to San Juan, Puerto Rico, when it was disabled by the storm. "We're going to go and try and save lives. We're going to push it to the operational limits as far as we can,'' Coast Guard Capt. Mark Fedor said of rescue efforts. Fedor said there were 20- to 30-foot (up to 9-meter) waves in the area, and that heavy winds could have destroyed the ship's communications equipment. The ship went missing when Joaquin was a Category 4 storm. The hurricane has since weakened to a Category 3. Late Friday, the Coast Guard said the planes and helicopters involved in the search had returned to base because of darkness. Florida-based TOTE Services, the ship's owner, said in a brief statement that it was working with the Coast Guard and trying to establish communication with the craft. Joaquin, meanwhile, was moving away from the Bahamas on Saturday. Its threat to the U.S. East Coast was fading as new forecasts showed it was likely to curve out into the Atlantic while moving north and weakening in coming days. Authorities in the Bahamas were expected to need days to assess damage on the hundreds of islands and cays that form the archipelago. There had been no reports of fatalities or injuries so far, said Capt. Stephen Russell, the director of the Bahamas National Emergency Management Agency. Joaquin had maximum sustained winds of 125 mph (205 kph), according to the Miami-based hurricane center. 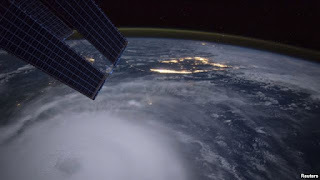 By early Saturday morning, the storm was centered about 165 miles (270 kilometers) northeast of San Salvador, Bahamas and was moving northeast near 13 mph (20 kph). Rick Knabb, director of the hurricane center, said Joaquin was expected to pass well offshore from the eastern seaboard. "Joaquin is going to generate a lot of wave energy,'' Knabb said, adding that Bermuda might issue a tropical storm or hurricane watch, depending on Joaquin's path.